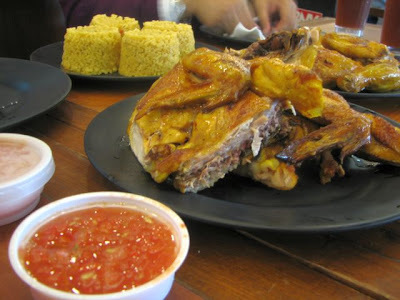 One of the restaurants we frequent in Manila is El Pollo Loco. What made visits special is that once upon a time, El Pollo Loco can only be found in SM Megamall. But it has since branched out to other malls. Loosely translated, the name of the establishment means crazy chicken! El Pollo Loco specializes in Mexican food and chicken is their specialty (which you might have already guessed from the name of the place). Their chicken, I must admit, is primarily the reason why my friends and I keep coming back for more. It has a distinct taste due to their special marinate and it's not coated with batter. Accompanying the chicken is the salsa, which you can have mild or hot. I think, though that the hot variety is not the "burn your mouth and run for water" variety. It's sufficiently spiced up for me. The chicken and salsa is accompanied by Spanish rice and some tortilla. The tortilla is a round, flat piece of bread which we tear up in to, open up to resemble a taco, then stuff in the chicken and salsa and spanish rice. Absolutely divine. Wouldn't you say so, Pauline? We always enjoy dining at El Pollo Loco and will surely be in my list of must-visit places when we go on vacation in the Philippines. 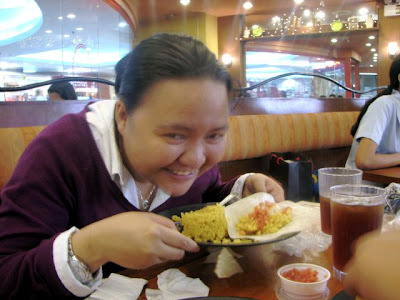 grabeee.. not my best food photo :P hahahahaha.. i miss el pollo loco :D they have na in Mall of Asia... :) no one eats there :D hahahahaha... ako lang ata!